Jennifer Bennetch with her son, Yusuf Williams-Bey protest outside the Starbucks on 18th and Spruce Streets on April 18, 2018. We are in the midst of a resurgence of American racism that is marked by a storm of aggressions aimed squarely at people of color. From the L.A. Fitness in Secaucus, N.J., where staffers called police on a black member and his black friend who was visiting with a guest pass, to the Grandview Golf Club in York, Pa., where staffers called police after a co-owner complained that a group of five black female club members were playing too slowly, the incidents illustrate a disturbing pattern. That Philadelphia is now ground zero for the discussion of race in America is but a coincidence. As we've witnessed in one videotaped interaction after another, the incident in which a Starbucks manager called police on two men for Waiting While Black has happened in other places. But with no white witnesses to bravely stand up against wrongdoing, the complaints of black victims have been dismissed as lies. Rashon Nelson, left, and Donte Robinson, right, were arrested at a Philadelphia Starbucks on April 12. Still, we can't pretend that Philadelphia is a bastion of racial enlightenment where the Starbucks incident is a rarity. In reality, Philadelphia is a place where systemic racial injustice is a time-honored tradition. That's why, when Mayor Kenney writes in an op-ed that Philadelphia is a place that is welcoming and treats everyone alike, I appreciate his attempt to bring us all together in the spirit of unity. But I also know that portraying Philadelphia as a bastion of multicultural harmony is a false portrait. Most of Philadelphia's neighborhoods and schools are racially segregated. Our institutions and organizations are split along racial and ethnic lines. Our building trade unions are largely divided along racial lines, a fact that limits black and brown participation in taxpayer-funded construction that is mandated to go to union labor. And the Mummers — an organization that Kenney once belonged to — for years engaged in racist portrayals of blacks and Latinos in their annual parade. So racism in Philadelphia is not only practiced. It is celebrated. That's why astute observers weren't surprised that a Starbucks store manager in Philadelphia could call police on men who'd done nothing wrong and have those men arrested. Police in Philadelphia have long been agents of harassment for black and brown people who've done nothing wrong, and the numbers bear out that truth. In a lawsuit filed six years ago against the City of Philadelphia concerning its "stop and frisk" policing methods, the data showed that the tactic, which is only supposed to be used when there is reasonable suspicion that a suspect has a weapon, was disproportionately used in black and brown communities. 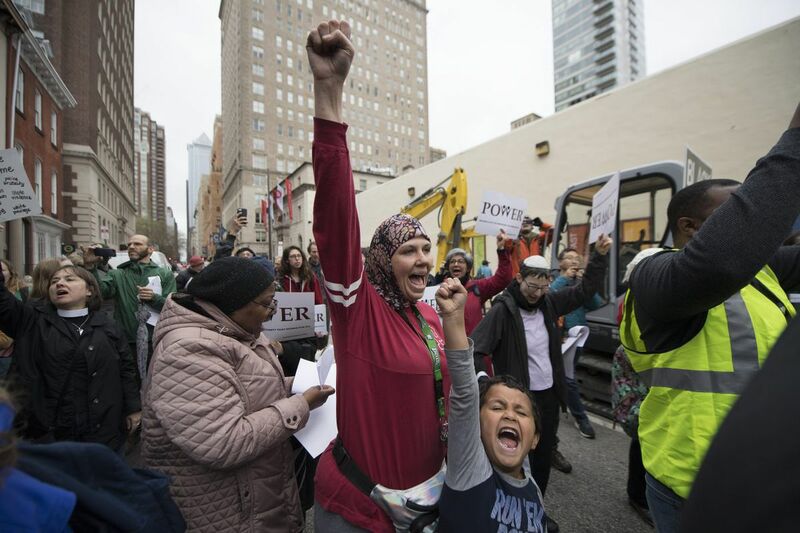 "When we started the lawsuit, police were stopping 250,000 people a year in Philadelphia," said David Rudovsky, a civil rights attorney monitoring police stops in connection with the lawsuit. "Our review showed close to 40 percent of the stops happened without legal justification…"
Still, the racial disparities in police stops remain a huge issue. In a recent analysis by the Inquirer and Daily News, reporters found that nearly 70 percent of those stopped by cops inside downtown Philadelphia businesses were black, while only 19 percent were white. And the numbers on stop and frisk are equally alarming. Nearly 70 percent of those who are stopped by police in Philadelphia are black, though blacks are only 45 percent of the population. And when the stops lead to frisks, a weapon is recovered only 1 percent of the time. So the method is not just racially discriminatory, it's ineffective. And when Rudovsky and his experts look at nonracial factors such as crime rates by police deployment and economic factors, those factors don't explain why blacks are stopped so often. "We think that there's still a problem in terms of the racial disparity," Rudovsky said. I think there's still a problem, too. That's why, instead of trying to portray Philadelphia as an example of racial harmony for others to follow, we must accept that Philadelphia — like much of America — has built racist systems that are operated not just by whites, but also by blacks in positions of authority. Systemic racism is what allows black police commissioners to back officers who treat blacks differently from whites. It's what allows a black judge to sentence Meek Mill to jail in a ruling so egregious that white judges overturn it. It's what allows a mayor to pretend our race relations are better than those in other places, when clearly they are not. If we are to truly erase this new age of racial animosity in America, we must be truthful about the nature of the problem. We can start by doing so in Philadelphia.